Mortgage Rates Are Dropping, So Why Aren't People Buying Homes? Even though mortgage rates are at their lowest level in a year or so, less people are applying for loans. Why is this? According to the most recent data from the Mortgage Bankers Association, the average interest rate for conforming 30-year mortgages dropped last week to 4.26%, its lowest rate in almost a year. You might expect this to have provided a boost to home sales and refinancing, but surprisingly the opposite effect has been seen. So, why aren't people buying homes? Sure, in many parts of the country; housing prices are nowhere near where they were before the crash. However, they have risen significantly from the bottom. For example, in Las Vegas, one of the hardest-hit areas by the housing collapse, home values are up by 22.4% in the past year alone, and are more than 57% higher than their bottom in early 2012, according to Zillow. Many of the other hard-hit areas like Florida and Arizona have seen similar gains. 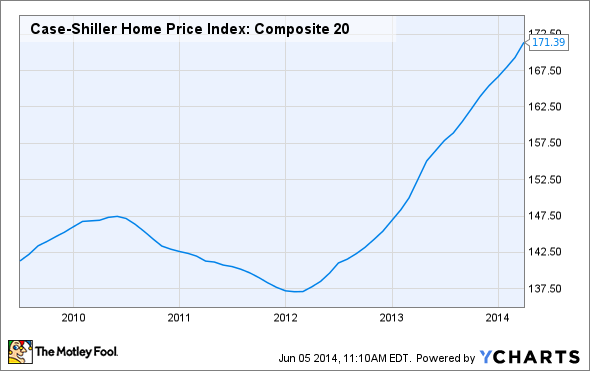 As a whole, home prices in the U.S. are up nearly 27% from the bottom, and the rise has taken place pretty fast. Regardless of interest rates, if people feel homes are too expensive, they're not likely to buy one. Lending standards have relaxed a bit since the end of the financial crisis, but are still pretty tight on a historical basis, and have tightened a bit so far in 2014. In order to qualify for a conventional mortgage, most banks want a very high credit score, 20% down, and enough documentation to fill a book. According to Ellie Mae's Origination Insight Report, the average FICO score for approved conventional purchase mortgages was 755 in April. Even though this is down from the peak of 763, bear in mind that anything over 720 is considered "excellent" and anything between 660 and 719 is considered good to very good. In fact, the average FICO score for a denied conventional purchase loan is 724, meaning the average person who gets denied a mortgage has "excellent" credit. This is slightly up from the March average of 722, so mortgage credit has actually tightened slightly. A few years ago; it was much easier to be a first-time homebuyer than it is today. Most first-timers don't have 20% of the purchase price for a down payment, so options like FHA financing are all that are available. FHA loans have always been more expensive than conventional loans, but a few major changes over the last few years have made it even pricier. In 2012, mortgage insurance premiums rose significantly. The upfront premium, due when the loan is closed, rose from 1% to 1.75% of the loan amount, and the annual premium rose by .1%. Now, the mortgage insurance used to not be as big of a deal, since you could drop it after the loan was paid down to a 78% LTV (loan-to-value) ratio. However, as of 2013, this is no longer the case. For FHA loans with a 5% down payment or less, the mortgage insurance must be paid for the life of the loan. Sure, you can always refinance down the road, provided you meet the strict credit standards for a conventional refinance loan. To illustrate how unaffordable these loans are, picture two scenarios for the purchase of a $300,000 home, one conventional and one FHA. The conventional buyer puts 20% down and finances the other $240,000, resulting in monthly payments of $1,182. The FHA buyer only puts 5% down, so they'll have to finance $285,000, which already increases their payment to $1,404. However, FHA mortgage insurance adds about $320 to the payment, which brings the total monthly payment to $1,725 or a whopping 46% more than a conventional loan. And don't forget about the nearly $5,000 in upfront mortgage insurance added to the closing costs. So, there are options for first-timers and those with less-than-perfect credit. They just aren't very good options. First time homebuyers generally represent about 40% of the market, so if they can't afford homes, sales will certainly drop. The combination of tight credit and higher prices may be keeping a lot of buyers on the sidelines. Interest rates could remain relatively low for some time now, but until prices stabilize (stop shooting upward) and there are more viable options for decent-credit buyers and first-timers, we aren't likely to see a flurry of buyers come off the sidelines and into the market.